Did you know that Mini Mixers makes Cakes? Are you looking or a birthday cake or a cake for your little ones Christening? Cupcakes for a baby shower or are you looking to spoil mum on Mothers Day? I provide tasty cakes for any event. 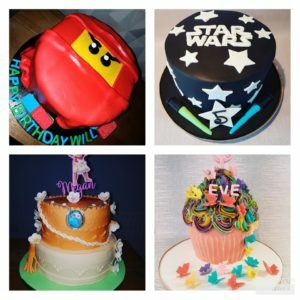 I have been baking cakes for friends and family for years but recently due to so many recommendations I wanted to share my love of cake with you too! You can choose the design and the flavour of cake but I must say, my most popular choices are chocolate & vanilla. My chocolate cake is very rich and moist with a thick chocolate buttercream….mmmmm. If you wuld like to discuss your order with me, please get in touch. Orders are collected from my home in Shotley Bridge, Consett or delivery may be available to surrounding areas of Durham. Costs apply.